Next show is #400! Sign up for the NosillaCast Party at Macworld | iWorld, the show gets an audio uplift with a Heil PR-40 from Steve for Christmas. Doug Ingram, aka @douggyi on Twitter and in the live chatroom sends in his first audio submission in 4 years. Mac Mania 15 – Creating Spectacular Documentation video is posted, and HDA Bob is back with a review of iCircuit for iPad. In Chit Chat Across the Pond, Bart answers Ed’s dumb question about removing GPS info from his photos, and then finishes his talk on photographing the heavens. Hi this is Allison Sheridan of the NosillaCast Mac Podcast, hosted at Podfeet.com, a technology geek podcast with an EVER so slight Macintosh bias. Today is Sunday December 30, 2012 and this is show number 399. Looks like next week is the big show – 400 episodes! I can’t believe we’ve been going that long together, can you? I’m actually kind of glad that all the other podcasters seem to go on break time so you are starved for content just when you have some time off, because we’ve got a HUGE show for you this week. We’ve got a lovely message from Doug Ingram, a review of iCircuit from none other than the intergalactically famous HDA Bob, one or two reviews from me, and Chit Chat Across the Pond with Bart. This week we answer a geotagging question from Ed Tobias and we have the second half of Bart’s talk on how to film the night sky. Hope you’ve got a lot of time to listen, so let’s get started. Don’t forget to sign up for the NosillaCastaways party at Macworld | iWorld on Friday February 1st. There’s a link in the shownotes to the sign up page – password protected with the name of my favorite software. There’s also a tab in the menu bar right to the sign up page too. Hope you can come! As usual Steve was way too generous with me this Christmas. I don’t think anything gives him as much pleasure as giving the perfect gift. You may have noticed that my audio sounds a bit better – that’s because Steve got me the Heil PR-40 microphone. It’s not like I was suffering, he got me the PR-20 a few years ago and I’ve been really happy with it. I wish I knew more about microphones, like what the frequency response curves mean (PR-40 vs. PR-20) so I could explain to you why the PR-40 is so much cooler, but I’m too lazy to actually spend any time reading and learning. I did read about the two mics in comparison and the PR-40 has a couple of interesting features – the diaphragm of the mic is vibration isolated from the body of the mic, so I’m working without one of those spring thingys I had on the PR-20. I did a test to see if you could hear me typing while I was recording and it appears to be isolated really well. The PR-40 also has two screens between the front and the diaphragm acting as pop filters built in – but Steve got me the pop filter to go with the PR-40 so it’s hard to tell if I needed it or not. It’s way cool looking so it’s worth it either way! I love how compact it is not vs. my PR-20 Plus the GIANT pop filter I had and the springy thingy (vibration isolator) – now it’s all sleek and cool looking. Hope it SOUNDS good too! Next up I’d like to play a recording from Doug Ingram, aka @douggyi on Twitter and in the live chatroom. He sent this in for last week’s show and unfortunately I forgot to play it. It still works this week but my apologies to Doug for not playing it on time. Hi there Allison, Steve, all the Nosillacastaways and anyone else listening to, reading or otherwise consuming this podcast. It’s Doug Ingram here from Sydney, Australia, the land of December summers and the starting point for one very auspicious Mac Mania cruise this year. Well, in true Nosillacast fashion, I need to start my contribution by identifying the problem to be solved. My problem is that I’ve been trying to find the time to send in a submission to the Nosillacast all year. Actually, looking through my GarageBand files, I should say that I’ve been trying to find the time for four years! I can’t believe that it’s been four years since I last sent in an audio contribution to the Nosillacast. Have you missed me? OK, so I don’t have a problem that’s impossible to solve. The solution is to make some time and do it, despite how strange my family think I am for sitting in my little home office and recording myself. You know, thinking about it some more, I guess that, really, I don’t have a problem to be solved and I just wanted to get my voice on the Nosillacast. Allison, since meeting you and the wonderful Steve during your brief visit to Sydney in November, I have been trying harder to put together something worth listening to as a contribution to the show. A few weeks back I got as far as writing the script for what I was going to say and then, as usual, my Mac support customers beckoned and that was the end of that. I’d love to be contributing a review, a tip, a hint, a “dumb question”, an answer to a “dumb question”, or even a chit-chat across a body of water, but all I can do is send in this greeting and leave it up to you all to decide if is actually something worth listening to. So after all that preamble, what is my contribution? It’s to say this: thank you Allison, for everything you’ve done for all us NosillaCastaways and the wider Mac community this year. As with the all of the years that I’ve been listening to you, this year, because of you, I’ve learned new ways of doing things; unlearned some bad old ways; spent money on apps and accessories that I might or might not have needed; been made aware of other podcasters, developers and Mac folk that I might not have otherwise discovered; been introduced to the voices of other listeners; and had my eyes opened to other platforms and processes that I wouldn’t normally consider. 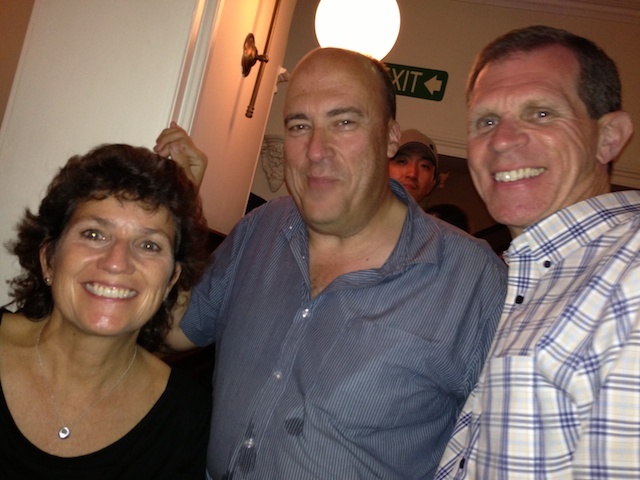 Meeting you, Steve and Don McAllister in my home city was a buzz. My non-podcast family had no idea what I was so excited about and took their usual “just humour him” approach when I told them about the meet up in that pub in Sydney. I’m grateful for the event because I now have new people that I’ve met in my own country, such as OzRose, Steven Sommer, TrevInCanberra and also close by in New Zealand–Allister Jenks. Thanks for being available to meet some listeners, especially after that long flight down from LA. I’ve done that trip quite a few times and I always feel hammered afterwards. You guys did great! Merry Christmas, season’s greetings, Happy New Year and every other wish for happiness for this time of the year and into 2013. You do what you do so well and this one guy down here, “down under”, appreciates you very much. Cheers, Allison, from Doug. Doug this is such a thoughtful recording. It means so much to me to hear about the impact the show has on people. We do the technology thing for sure but there’s something special about the NosillaCastaways themselves and how you guys connect to each other. It’s a common theme in the live chat that this annoying woman keeps talking in the corner while everyone is trying to chat! I’m so glad we got to meet up in Sydney – that was a real treat for sure. Hope you do more recordings than every four years – you have a fabulous voice and I’m always a sucker for a great accent. Steve has posted another one of my presentations from Mac Mania 15 – it’s called Creating Spectacular Documentation. I start with the built in screen grab utilities, then moved up to tools like Skitch and Jing for just doing screenshots and then went for the big guns and demonstrated ScreenSteps and Clarify. It wasn’t a paid presentation, it was pure enthusiasm for the products. I think this was the best presentation I did – people loved it, but said the title didn’t do much to convince them to come see it. If you have ideas for a better title, I’d love to hear them. Anyway, the video is embedded in this weeks shownotes, and of course it includes a direct link to the video if you’re using a screen reader. HDA Bob is back with an iOS review – this one is REALLY cool! Allison, as you might not know, I have an electrical background from the military. And as you already know I have a 2011 Honda Pilot that I got a couple years ago that is my mobile service vehicle. Well, being a geek at heart I DID modify it slightly. I installed an air compressor system in the back for inflating tires and other things. Naturally I had to wire all the controls in. But before I started I sat down and sketched out a wiring diagram for what I wanted it to do. After getting everything in and trying it out, I realized that some of the wiring didn’t work like I thought it would. I had to go back and redo a couple of circuit elements to get it to work like I wanted. Recently I was thinking about adding some more modifications to the charging system, because there’s a lot of drain on my batteries because of the compressor system load. Well, iCircuit to the rescue. I found this nice simple app in the app store Called iCircuit. 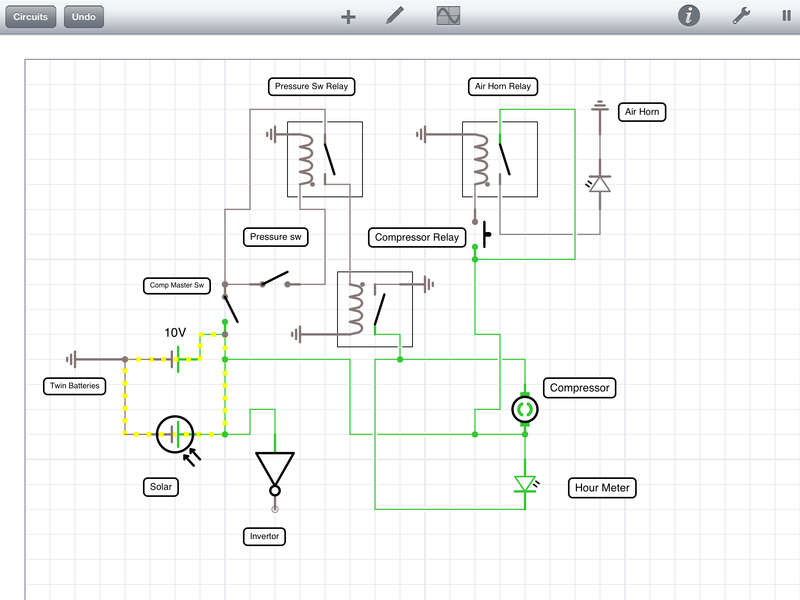 iCircuit is an iPad and iPhone app for designing and experimenting with circuits. The advanced simulation can test both analog and digital circuits. It also has real time analysis that is always on. You can use iCircuit just like you would use a CAD program. You can add elements, hook them together and configure their properties as you need. Since it is always simulating, you can add and remove elements with the power still on. A multimeter is always on to tell you what the values are. There are over 30 design elements to work with. It has everything from switches, relays, and lights all the way to digital amplifier circuits. Check the multiple samples and build your circuit from there. The parameters of each tool can be modified to suit your circuit. In other words you can change a relay from two contacts to as many contacts that you need. Or change the resistance of a resistor, as well as changing polarities and voltage values. What is nice about iCircuit is, it allows me to construct a circuit and test it, all while the power is on. It also tells you while you were building the circuit if that particular device will not work the way you have it wired. (In other words if you have a short or open circuit) As a test, I rewrote my circuit for the compressor in iCircuit and found out where I went wrong. After I was done I was able to make a copy of the entire circuit, print it out and then keep it in the maintenance records with my service manual. Now I’m in the process of writing another circuit for my charging system on my pilot. I’m trying to wire it in such a way that will keep it from interfering with the charging system on the vehicle. I did find a way to increase the amperage output of the charging system to compensate for the extra load, so that should help. iCircuit is developed by Krueger systems Incorporated And is very reasonably priced at $9.95. They only recommend using it on Newer Generation hardware because it is CPU intensive. It will work on older units but it’s a lot slower. Krueger Systems is constantly updating the program with more and better tools. So, if you are a GEEK like me, then iCircuit is the app for you. GREAT review Bob! Bob gave us a screenshot of his iCircuit diagram – wish you could see it running real time. Really cool to see how he can open and close the circuit, remove elements and see the effects. I gave my daughter Lindsay a portable drive for Christmas that was filled with our home movies. Lindsay LOVES to watch home movies. I’m not so sure her boyfriend Nolan is all that excited but that will be his cross to bear. Years ago Steve transcoded all of our VHS tapes onto DVDs and then at Bart’s urging moved them from DVD to disk images on a hard drive as the DVDs themselves were beginning to degrade. For a long time these disk images sat idle though because it was such a supreme hassle to open each one up to mount it as a DVD, play it in the DVD player to look at the scene selections to see which one was which. We still used the DVDs. Last year Knightwise and a few others told me about an open source media center app called XBMC from xbmc.org that runs on OSX, Linux, and Windows. I did a review of it on Episode #363 back in April. Anyway, I thought I’d just fling that on Lindsay’s Mac and she’d be off to the races with her home movies. I put it on while she was gone and realized that I couldn’t remember how to easily access the DVDs. if I clicked on Videos and then clicked on the home movies volume, it would keep drilling me down to the VIDEO_TS fils which is just as bad as if I hadn’t used XBMC at all. Well I finally fumbled through the menus to figure it out – and what do you think I did next? Ok everybody sing along – I opened up Clarify from BlueMangoLearning.com and made two short tutorials. The first one was really for me – the one time setup to get XBMC pointed at the volume so she didn’t have to ever do it again and I didn’t have to figure it out again, and the second one was just a few steps to show her how to play her movies. After she does it a time or two she definitely won’t need it but since I wouldn’t be there when she tried it I figured I’d give her a fighting chance to get started. I love using Clarify and it’s big brother ScreenSteps because I can make someone else’s life easier and MY life easier. They get an easy tutorial, I get to answer the question only once, AND I get the added bonus of a tutorial to remind ME how to do something so my feeble brain doesn’t have to remember. If you’ve got a feeble brain and you like to help out family and friends, I highly recommend you click on the Clarify logo at podfeet.com or go to BlueMangoLearning.com and give Clarify and ScreenSteps a free trial and see which one you need. Lets start even more basic – to be sure a geotag is gone, you need to learn how to read geotags in images. On the Mac this is trivially easy, just open the image in Preview, bring up the inspector (cmd+i or Tools→Show Inspector), then go to the ‘More Info Inspector’ tab (second tab with the i in a circle icon), if the image has a geotag then there will be a GPS sub-tab that shows where the image was taken, if this sub-tab is not there, then there is no geotag in the image. How best to strip geotags really depends on your workflow. I use Aperture to mange my photos, and you can set Aperture to strip all EXIF data in an export preset, so I have a preset to export JPEGs at 1024px in the widest dimension with all EXIF stripped that I use when exporting a sensitive image for sharing on the web. If you use iPhoto then there is a radio button when exporting images that controls whether or not location data is exported with the image or not. Another option is to use an app for editing EXIF data. A quick search of the Mac App Store yields the following as an interesting option: Exif Editor but it’s not free. How ever you choose to strip your geotags, be sure to check that the tags really have been stripped with Preview when testing your workflow! I do all my geotagging using Aperture’s Maps app – I just drag and drop my images onto the map. You can also copy and page geotags in Aperture, so sometimes I also shoot a single shot at each location with my iPhone and then copy those geotags into the images I shot at each location with my DSLR. Bart made a comment right at the end of the Dumb Question section about Aperture supporting GPS tracks. I’ve spent a little time working on this in conjunction with the MotionX GPS app on my iPhone. I’ve documented the process here. It’ll probably work just as well with the Trails app. I’d imagine it’s just down to the format of the track file and exactly how you get it from the phone to Aperture. The reason why app updates have been quiet lately is that the entire iTunes Connect department (i.e. the people that receive app submissions, review them and approve/deny them) shuts down during the week between Christmas and New Years. So no app submissions can be submitted, all apps currently in review are basically stalled until the iTunes Connect staff returns, etc. You’ll sometimes see a smattering of app updates come out during this period, but these are usually automated – when an app gets approved, the developer has the option of either releasing it immediately, or after a time delay. Actually, Iridium the company still exists, and they still run the Iridium service. The original Iridium company was teetering on the edge of bankruptcy and eventually did file Chapter 11 in 1999, and at one point there was fear that the Iridium satellites had to be de-orbited; however its assets were bought out by a consortium of investors and they relaunched (no pun intended) and the service is still running today. Makes sense though since it is an essential communications link to far off bases such as McMurdo research station on the South Pole. Also the US military is a heavy user of Iridium (they made up 23% of Iridium’s revenues in 2010), again this makes sense, probably for communications with troops and special ops forces and stuff all around the world. They still operate their commercial service (some 500,000 or so subscribers strong), and it is the only way for various expeditions to keep in touch. Chris Marquardt used it on his Himayalan photo expeditions, and Roz Savage uses it extensively during her various rows across various oceans of the world. Picante has banded with chefs in Central and North America to forma menu that translates for all parts of Mexico, with local suppliers to provide the fresh ingredients that make even the simplest dishes standout. I want to talk to you today about a very serious topic.